RT Ecommerce is a Free E-commerce WordPress Theme. It can be used for any kind of stores like a jewelry shop, online book market, cloth store, fashion store and much more. You can make any kind of store with this responsive Woocommerce WordPress Theme. Our E-commerce WordPress Theme is developed with the clean coding and most important by keeping all the WordPress coding standard in mind. You can set up your own store and start your business. You will get ample of features and customization option. The theme has a full-width banner which makes the user a great impact who comes to your WordPress website. It also has a call to action (CTA) which we believe a great way to achieve the highest clicks which further help you in the lead generation. 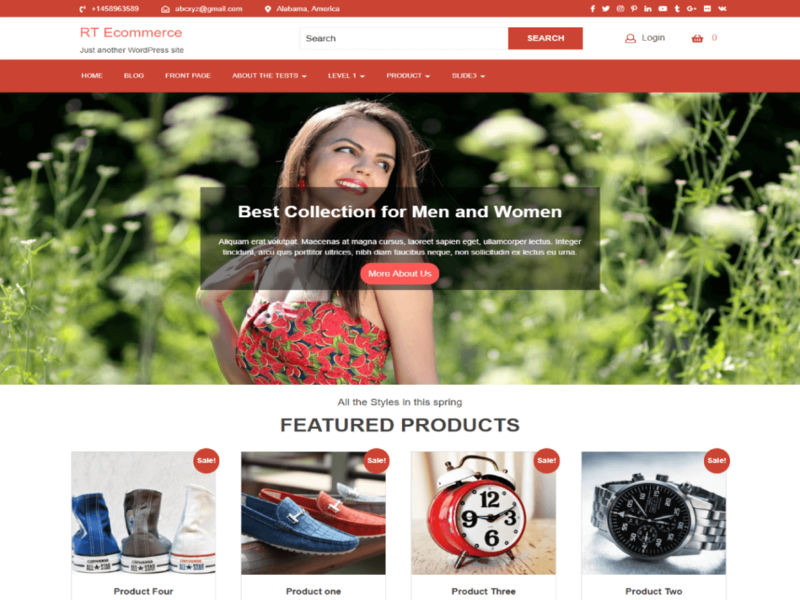 Our E-commerce WordPress theme is SEO friendly which helps you to drive traffic to your website. You can showcase your featured products on the main page itself which attracts your visitors.